bambooweb.info • View topic - Anyone interested in charity case? Anyone interested in charity case? Post subject: Anyone interested in charity case? I am a bit strapped but I'd really like to grow some bamboo. I'm looking for any midsize, smallish timber bamboo to grow ( anything that grows within 1" to 2"~ diameter). I want to use it as and evergreen screen as well as something that could give me sturdy garden stakes and poles from time to time. I live in zone 8. Post subject: Re: Anyone interested in charity case? Greetings, I obtained my first bamboo by placing a free ad in the local food coop newsletter - I'm not suggesting that you do that but how about Craigslist instead - place a free ad that says 'Bamboo out of control? I'll get your grove back in-bounds in exchange for some of the plants.' I got so many contact that I could not follow up on them all and I had lots of free bamboo. Free except for the labor. I hightly doubt that will work, and cleaning bamboo sounds pretty hard in some cases. I picture some guy with like 1 acre of bamboo somewhere asking me to remove ALL of it for free with me having little more than my suv and a garden spade. In any case, I don't think anyone really grows bamboo where I'm at. I saw a nursery that sells little clumping bamboo (not quite what I need). I did this as kindof a crapshoot. ANYHOW. I'll try the craiglist thing, see what bites. I'll update if I get anything at all. The closest place that advertises bamboo removal, is like 2-3 hrs away it really looks bleak . I got my first bamboo (Alata) for free I saw it growing along the road and just stopped and talked to the owner about it and just asked if I could dig some sometime. My second (Bissetti) I got by replying to craigslist Ad that was selling large poles. I think they were $1 a piece or something but were 2inch plus I asked how much to get live culms and some root I think I paid $5 but he dug about five great divisions and had a stack of poles for me I think I paid I was to pay$15 but I gave $25 or something because I was not expecting him to do all the digging. So the moderator hadn't gotten around to my 1st reply. 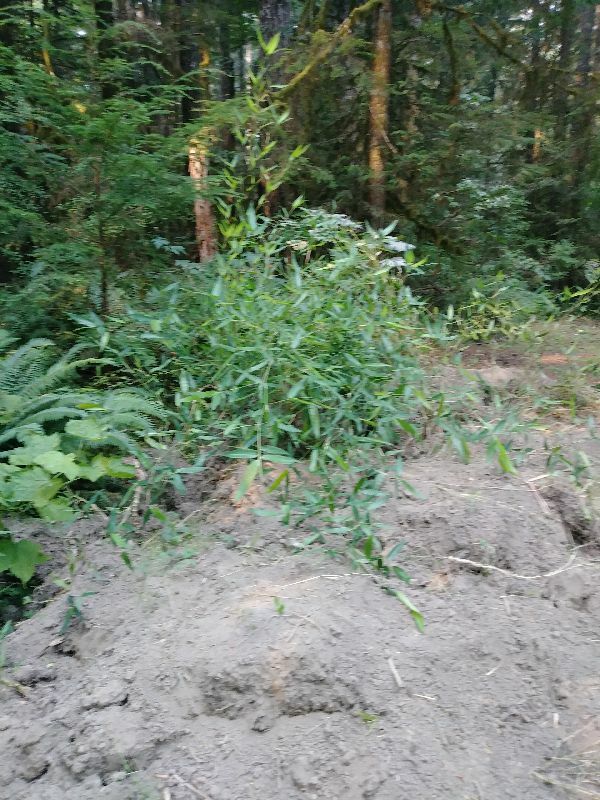 So I did what he suggested posted a craiglist ad (so far I hadn't gotten anything, bamboo seems to be uncommon in Bellingham, and more a Seattle & south problem). Either there are more gardeners that are more responsible/scared of the stuff or it's just not attractive to people here. I already have a hardy clumper know as Fargesia Robusta as a gift my mother noticed my interest in bamboo but it's just not quite what I need I'll grow it either way it still will give me like 12' 3/4" stakes to play with but I fear it won't be enough for larger projects). I found a guy who was giving his bamboo for free but it was a month or so old (he said he dug it up and I figured it is probably already dead/given away). Yesterday he replied saying he had some left but very small and young, though he assured me will easily get the size I want as it matures, "it grows fast" was what he said. So I wonder if they shoots will come back with more girth the following years. So any thoughts on what is at least 7b-8a hardy, most likely a runner, matures 1"+ thick, and looks like this? - I'll try to get better pictures when I actually get it.